BioShock 2's "Rapture Metro" pack of downloadable content, abruptly delayed from its original release two weeks ago, was rescheduled just as abruptly today. 2K Games today said the DLC rolls out tomorrow. The DLC is 800 Microsoft Points/$9.99 and is available on PS3 and Xbox 360 tomorrow. The PC version of the DLC is on the way with an unspecified delivery date. With it you get six new multiplayer maps, three new achievements/trophies, and a "rebirth" feature that awards a special mask to players who have hit level 50 and choose to rank down to level 1. 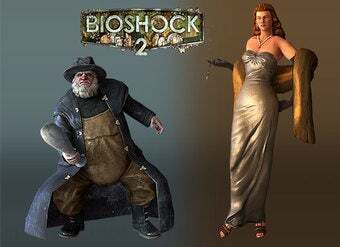 2K also reminds that a Character Pack that includes Zigo the Fisherman and Blanche the Actress (pictured), will also be available tomorrow for 160 Microsoft Points/$1.99. You might remember that both of these multiplayer characters were available as pre-order premiums through GameStop. Both it and the Rapture Metro pack are said to be available for PC "soon."